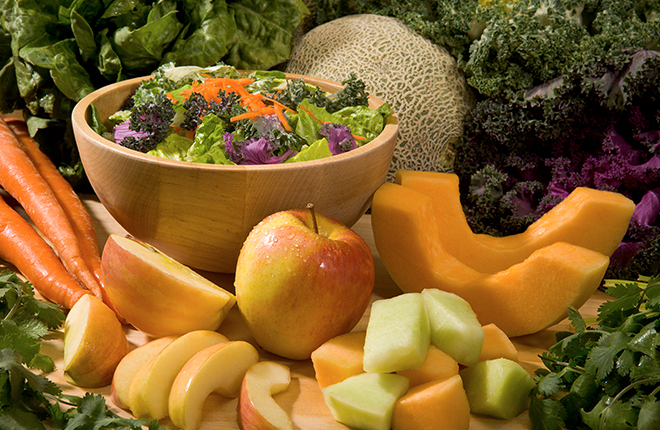 ARS and a commercial partner developed a new organic antimicrobial wash for fresh produce. (Peggy Greb, D530-2). Sometimes it takes time to find a winning formula. That’s how it was with First Step+ 10, according to Joshua Gurtler, an Agricultural Research Service scientist at the Eastern Regional Research Center, in Wyndmoor, Pennsylvania. Gurtler and his collaborators at NatureSeal, Inc., tested hundreds of antimicrobial formulations, in a series of carefully designed laboratory experiments, before they found the right combination of lactic acid, fruit acids, and hydrogen peroxide for a wash that reduces the risk of food-borne pathogens contaminating fresh produce in food processing operations. “It’s an exacting process, finding the right organic compounds and formulating them into a solution that will perform effectively,” says Gurtler. Escherichia coli, Listeria, Salmonella and other food-borne pathogens sicken approximately 48 million people each year, or about 1 in 6 Americans. Food-borne pathogens caused an estimated 4,200 hospitalizations and 80 deaths in 2013, according to the U.S. Centers for Disease Control and Prevention. A recent U.S. outbreak associated with cucumbers sickened over 765 people in 36 states and killed 4. First Step+ 10 is designed to reduce those numbers and is expected to be used in flumes and rinse tanks to wash fresh produce. Several NatureSeal constituent processors have already expressed an interest in using it, Gurtler says. Along with recently securing approval from the U.S. Food and Drug Administration (FDA), Gurtler and NatureSeal have filed a patent application and presented findings at scientific meetings. NatureSeal, based in Westport, Connecticut, already markets an anti-browning wash developed by another ARS team in the 1990s for sliced apples and 18 other types of produce. To save water, some food processors reuse wash water, a practice that can contaminate produce in subsequent washes. “Our number-one concern in commercial operations is cross-contamination from the wash water and pathogen levels,” Gurtler says. To test the winning formula, Gurtler inoculated fresh-cut apples, baby spinach, cantaloupe rind, and cherry tomatoes with highly resistant outbreak strains of E. coli, Listeria, and Salmonella. He soaked them in the wash and then measured pathogen levels in the wash water and on the produce. The antimicrobial wash reduced pathogen levels on the produce up to 99.99 percent.It also rid the wash water of 100 percent of the pathogens, making it safer to reuse. The wash can be shipped in concentrated form. Specific concentrations and treatment time used in a wash cycle will depend on the produce being treated and other factors, Gurtler says. But it will cut back on water waste because processors won’t have to replace water in their tanks as often. The wash ingredients are all classified as Generally Recognized as Safe by the FDA. The wash has also been approved for use in Canada; is USDA listed for organic use; is biodegradable; can be used with flume tanks and other industrial food processing equipment; and does not affect the taste, texture, smell, or appearance of produce. The antimicrobial wash is one of two recently developed by ARS scientists. The other wash (AgResearch, September 2015) has different ingredients and is intended to minimize the risk of harmful bacteria in fresh-cut produce.—By Dennis O’Brien, Agricultural Research Service Information Staff. “New Antimicrobial Wash for Fresh Produce” was published in the January 2016 issue of AgResearch Magazine. Food-borne pathogens sicken millions of people a year. A new wash kills pathogens on the produce and in the wash water. The ingredients are safe and are USDA listed for organic use.